With restaurants around town offering creative cocktails, signature snacks and picturesque views, there are plenty of perfect spots to relax during happy hour. From gathering with friends and family to get the weekend started to unwinding solo after a long day at work, many find happiness in local happy hours. 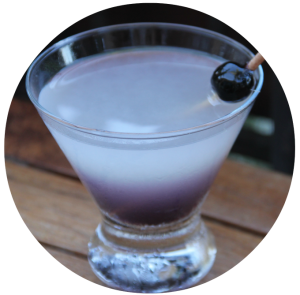 While discounts on cocktails offer a chance to indulge in your favorite drinks, the varied food menus at Laguna Beach restaurants allow diners to sample an array of innovative dishes that they might not try otherwise. But enjoying happy hour is more than simply sipping signature cocktails and dining on small plates. Sometimes it’s a chance to mingle with the locals and make new friends. 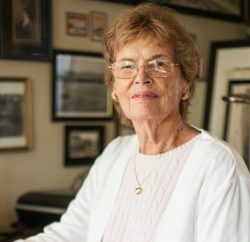 Sometimes it’s a gateway into a full-fledged meal and hours spent perusing menus with loved ones. And, sometimes, it’s a view of the sun setting over the ocean, live music being played in the background or a long conversation by the glow of a fire pit. Whatever reason you have for stopping by during these fabled few hours, you’re sure to find your happy place right here in Laguna. 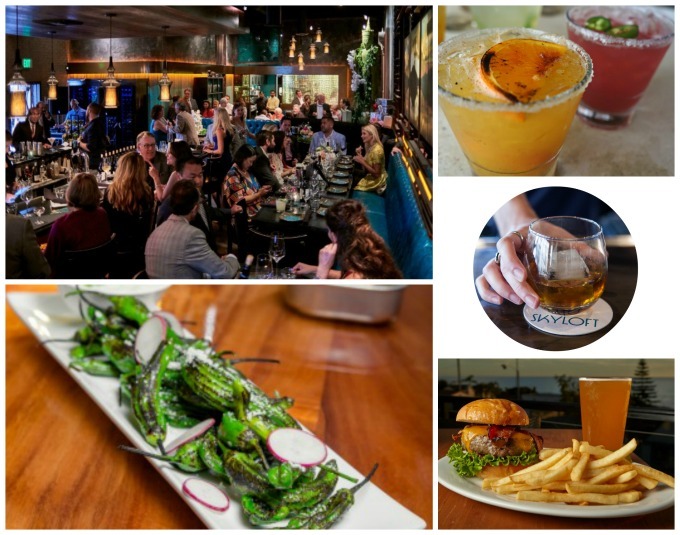 Find specials on everything from margaritas and martinis, to tacos to other appetizers during happy hour in Laguna Beach. Usually, upon hearing the words “happy hour,” images of colorful cocktails immediately come to mind. 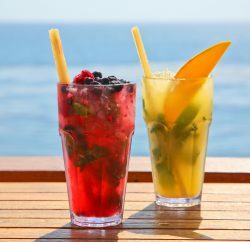 Those looking for their favorite drinks in Laguna are in luck, with a few spots offering ever-popular options like mojitos and margaritas. With six different types of mojitos, The Rooftop Lounge is a great location for libations. Choose from classic, strawberry, mango, wild berry tropical, Champagne and ginger, and get half off Monday through Friday. When it comes to margaritas, one of your best bets is Tortilla Republic, where you’ll find specialty pricing on not only the house margarita, but also the Don Julio margarita and the spicy jalapeno margarita. Avila’s El Ranchito is another great spot for margaritas, with $2 off. For deals on hot and cold sake as well as specialty cocktails like the lychee martini or a Japanese mule crafted with Iwai whiskey, visit Okura Robata Grill & Sushi Bar, while local eatery Starfish Laguna serves up hot sake jars along with unique well martinis in flavors like cantaloupe during its so-called Opium Hour. Those who prefer to stick to the basics—wine or beer—are in luck, too, as The Cliff Restaurant offers Wine Not Wednesday specials, with bottles marked at half price after 3 p.m., while Nirvana Grille serves both house and premium wines by the glass (chardonnay, merlot, cabernet sauvignon and even Champagne) during happy hour. For beer lovers, Sapphire Laguna provides a selection of brews from around the world, including places like Germany and Tahiti. Those wanting to sample a few different beers should head to Reunion Kitchen & Drink, where even the flights are discounted. Another tasty option is the Manzini cocktail at Mozambique, a refreshing green drink served in a tall glass. Lime juice and ginger liqueur perfectly complement the pineapple-infused vodka, while the level of spiciness (it also contains muddled jalapenos) is determined when you order. Themed cocktails can be found on Laguna happy hour menus as well, like The Hat Trick and the Slap Shot Sour at hockey legend Teemu Selanne’s restaurant, Selanne Steak Tavern. The eatery also has a drink called Mezzmorized (The Mighty Mezcal), which combines mezcal with egg whites and is topped with flamed rosemary. At Ben’s Pantry, located on The Ranch at Laguna Beach’s patio, cocktails are made to be sipped outdoors. When the sun is still up, opt for the lavender paloma, made with tequila and grapefruit, or the Qcumber Spritzer, which contains guava-flavored rum. Guests can also enjoy house-made sangria with pomegranate liqueur. By night, order the Campfire Cider, with whiskey-infused oranges and nutmeg, or the After Hours Hot Cocoa, a Godiva chocolate, RumChata and marshmallow mixture. 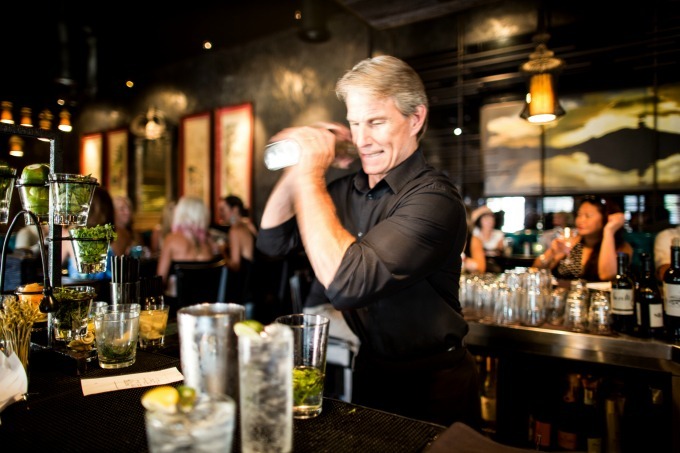 A bartender at Starfish Laguna mixes up drinks using fresh ingredients. Laguna Beach has some incredible cocktails, but the small plates and appetizers found on happy hour menus all across town allow local eateries to really shine. 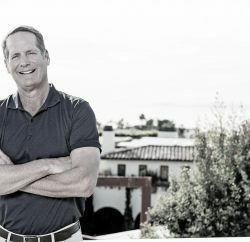 Some of the most unique dishes in town are coupled with a unique happy hour—the Sunset Celebration, which takes place between 5 p.m. and when the sun sinks down, at Las Brisas. Here, you’ll find an array of innovative small plates, from blistered shishito peppers and pork belly tostadas to pomegranate goat cheese tacos and the ever-popular baked fundido with chorizo, cotija and Oaxaca queso. Some of these progressive restaurants change their menu with the season; Three Seventy Common Kitchen & Drink is a fabulous example of a spot that always has fresh ingredients and unique dishes to enjoy. The current Pre Shift happy hour menu features favorites like the mini poutine, a smaller version of the eatery’s short rib-topped fries, and the chorizo deviled eggs with pickles and chilies. Another evolving menu is that of Tortilla Republic, where guests can currently enjoy a salsa trio, a mole chicken quesadilla or nachos topped with various meats, among others. The eatery plans to add additional items sometime later this year. Those looking for deals on Mediterranean food can visit GG’s Bistro for happy hour pricing on chicken kebabs, calamari, a Mediterranean salad or hummus, while sushi lovers will rejoice over Okura’s reduced pricing on rolls like tuna tempura, spicy California, veggie and more, as well as a sashimi sampler. Even with these innovative dishes popping up at every turn, some happy hour menus stick to traditional foods that keep locals and tourists coming back for more. Seafood lovers can stop by K’ya Bistro Bar for salmon tacos, lobster macaroni and cheese, Hawaiian poke and more, or enjoy traditional appetizers like warm Brie, burrata cheese or fondue. Closer to downtown, guests at Watermarc can select three, six or 12 oysters on the happy hour menu, or opt for a variety of grilled burgers. Taverna Laguna Beach is the place for pizza lovers, with happy hour specials cutting the prices in half on authentic Italian pies, like the Salamino, with spicy Italian salami and grape tomatoes, or the famed margherita. House, Caesar and beet salads are also discounted at Taverna. For pasta, enjoy Nirvana Grille’s wild mushroom ravioli, or opt for other salads like the romaine wedge or the spinach and warm mushroom salad. More casual bites are available at Lumberyard, Mozambique and Skyloft. At local favorite Lumberyard, snack on garlic fries, avocado toast or even fish and chips, while the Mozambique menu offers a variety of grilled skewers, samosas and sliders. Skyloft, on the other hand, stands out with fresh baked pretzels, a taco trio, brisket sliders and cornbread. Clockwise from top left: The interior of Starfish Lagua on a busy evening; cocktails at Tortilla Republic; Skyloft serves happy hour drinks; the blistered shishito peppers at Las Brisas. Food and drink are obviously the deciding factors for any happy hour adventure, whether it’s late at night or early in the afternoon. 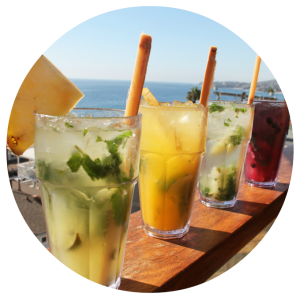 But there are some additional factors to consider when selecting the perfect happy hour place in Laguna. Because of the town’s location right along Coast Highway, there are many spots offering stunning views of the rolling waves and vibrant sunsets. Places like The Rooftop Lounge, Skyloft and The Cliff have especially wonderful views, out in the open air, unobstructed by glass windows and their reflections. Grab a few different dishes, sip your drink and watch the sunset from these special local perches. For a different kind of view, enjoy an afternoon or evening happy hour excursion to Ben’s Pantry at The Ranch at Laguna Beach. Available only on the patio overlooking the golf course, you’ll have a healthy dose of greenery to take in and golf games to watch as you unwind. Aesthetics aren’t the only way to get a “wow” factor as you wine and dine during happy hour though. On Wednesday through Saturday nights at Las Brisas, guests can enjoy live music for more than three hours beginning at 6:30 p.m. Elsewhere in town, Mozambique, one of the most musical spots in town, offers live music and DJs nearly every night of the week, and, though it starts just after happy hour ends, it’s worth sticking around for. Though happy hour implies it’s only for an hour each day, Laguna locals are lucky enough to enjoy many hours of these specials, especially during the week. Take advantage and sample some of the town’s best offerings, and you’ll surely find your happy place. 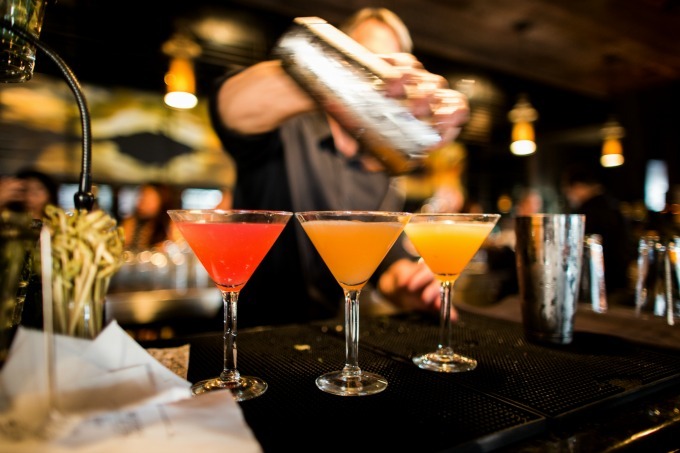 Find your favorite happy hour at these local spots.